CES 2011: Sony Vaio F Series brings 3D to your laptop | What Hi-Fi? 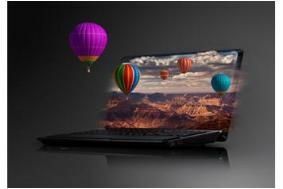 The Vaio F Series is fully 3D capable, has a 40cm Full HD display, can play back 3D Blu-ray discs and convert 2D footage to 3D at the touch of a button. To watch 3D footage you'll need a pair of active-shutter glasses. It uses frame sequential technology to display alternate Full HD (1920x1080) 3D images for the left and right eye at up to 240fps (frames per second). An Intel Core i7 processor is matched with a high-performance NVIDIA GeForce graphics card with DX11 support for smooth playback of Full HD video and games. Sound is boosted using Sony's S-Force Front Surround 3D technology which creates a 'virtual' 5.1 effect through two built-in bass-reflex speakers. Alternatively, users can get cinema-style surround sound via headphones thanks to Dolby's Home Theatre mode. Bluetooth and USB 3.0 connectivity allow for fast data transfer. Sony's new Vaio F Series laptops will be available from the end of February, price to be confirmed.